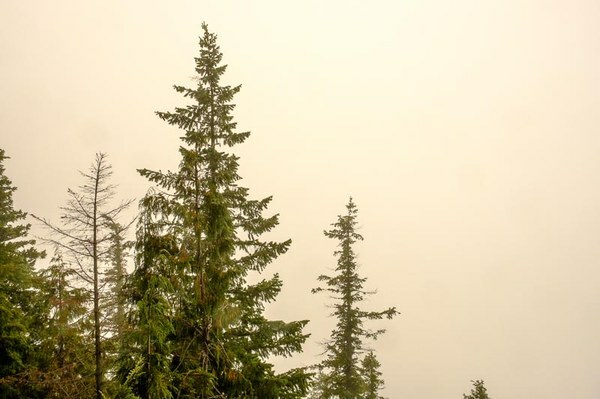 Hike Leader Tom Bancroft shares a magical trip report about a recent hike in the mist near Mt Rainier. Dense fog concealed the subalpine meadow in an eerie white veil. 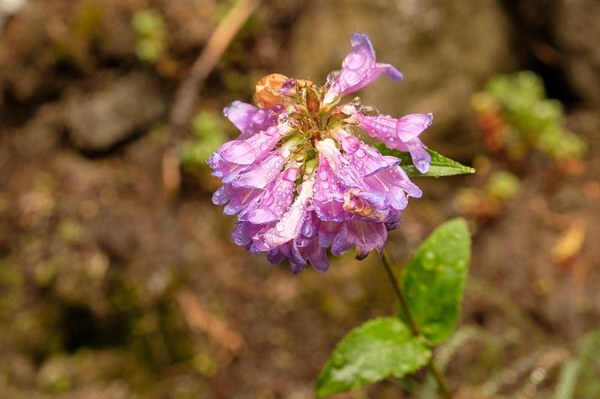 Water dripped from the firs and cedars, and our pant legs were soaked from touching the grass, lupines, and mountain hemlocks. Only a hundred feet in front of me, my friend, Laurie, began to disappear into the white. Waves of heavier mist drifted across the field and lasted for just a few minutes before passing. Every snap of a stick in the surrounding forest would cause us to stop and look. Spray Park is well known for its black bears, and we didn’t want to meet one in a cloud. 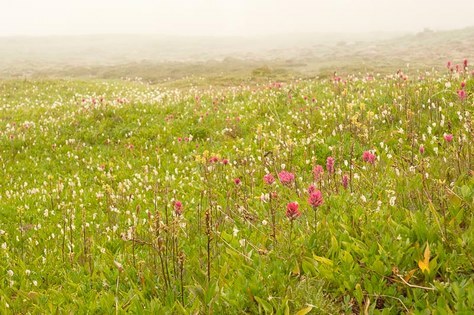 Flowers floated through the meadow in reds, blues, yellows, and whites. The magenta paintbrush seemed to give a pink cast to the fog. 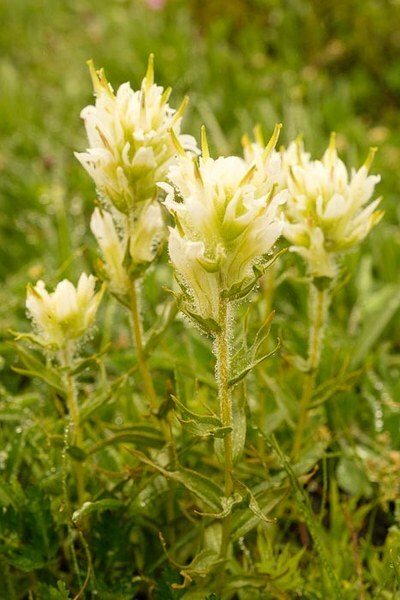 We even found white versions of this subalpine flower, causing us to stop and kneel. 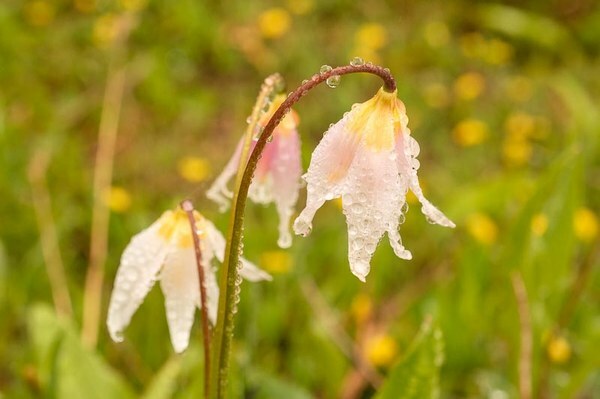 On this date in early August, depressions in the ground had avalanche lilies in full bloom because these recesses had just become free of snow. 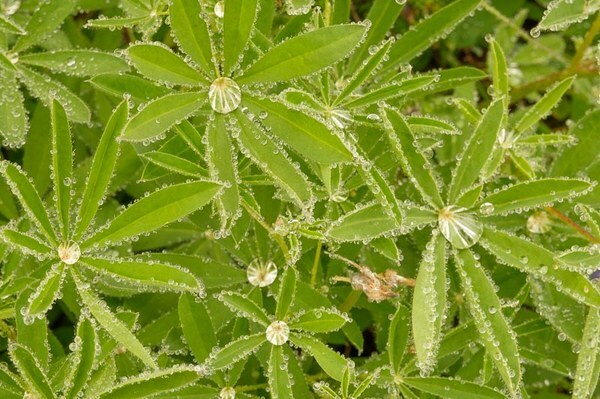 Water droplets dappled each white petal and clung to the red-brown stems. I finally laid on the ground to photograph these jewels. Harsh chatter from a clump of cedars not fifty feet to the north bound me to my feet. An adult gray jay with its brownish cap and white forehead and chest flew around the corner to land on an open branch and glare at us, hoping for food. A second later, a dark gray juvenile and two more adults arrived in unison. My muscles relaxed - not a bear - and the tension disappeared for the moment. 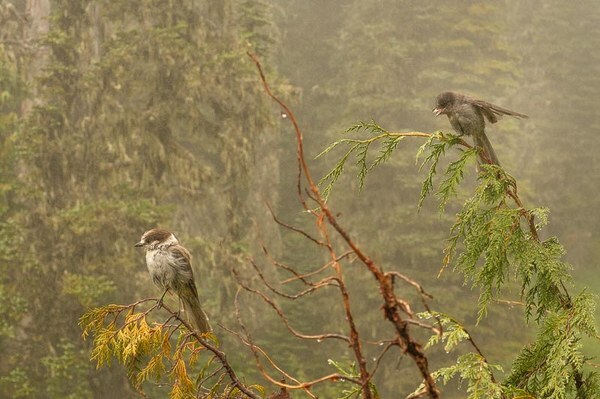 In a blink, the gray jays vanished. “Do you think we will see the mountain today?” I asked Laurie. 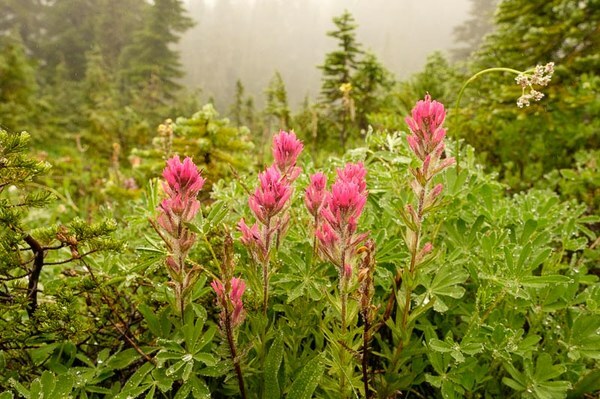 We both knew that someplace in the mist, Mt Rainier rose more than 8,000 feet above this subalpine meadow. Three of her flanking glaciers were only a few miles to the southeast. My friend pointed in that direction. As we gained elevation, the fog thickened and the mountainside took on a magical feel. A mother-daughter pair came up the trail and passed us hefting large backpacks with rain covers. They disappeared into the fog after asking us if we thought the mountain would come out today. In spite of the rain and the fact they already had climbed more than 2,000 feet, their cheerfulness was remarkable, contagious too. Nothing seemed totally real, the misty white air blurred everything, and within a few dozen yards nothing was visible. As we ate our lunch, looking down from a rock onto a white blanket, we wondered what the flowers might be like just out of view. Mother Mountain, a large rocky ridge with amazing features, was someplace through the fog in that direction, a legacy of a lava flow from Mt. Rainier. On the way back toward the trailhead, the witches’ hair took on a captivating feel in the dense fog. 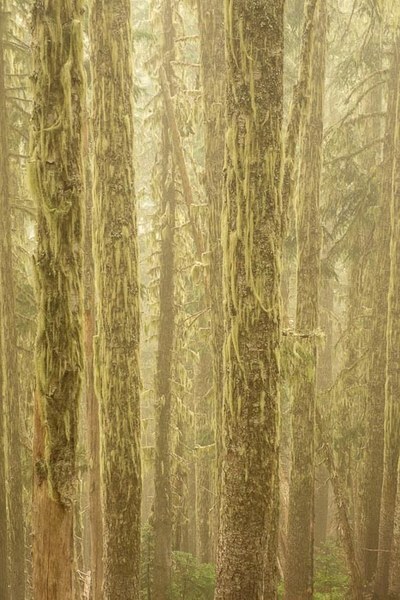 The long-greenish white strands of these lichens hung on the tall, straight trunks of the silver firs. Each blurry bole appeared to come alive in a new way, hairy faces that looked right back, trees that seemed to move with each blink. The fairytale had come alive. We lingered at each turn watching the forest drift through space and time. Well written, Tom. I enjoyed the writing and the photography. Thanks, Danielle, I appreciate it.